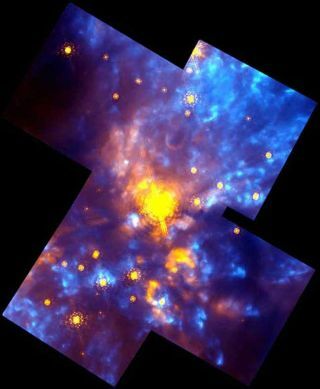 Circularly polarized light was observed at infrared wavelengths coming from the giant Orion molecular cloud, shown here in this image taken by the infrared camera on the Hubble Space Telescope. However, circularly polarized light has not been observed at the requisite ultraviolet wavelengths. Molecules vital to life have been detectedin outer space and isolated in meteorites and comets.? Some of this materialthat rained down on Earth may have jump-started biology. If so, these spaceseeds also may have planted a particular molecular orientation, or"handedness," that spread to the world's first creatures. Newresearch is studying how this handedness could arise in space. Aminoacids, the building blocks of proteins, exist in two so-called ?chiral? formsthat are mirrorreflections of each other, like a left and right hand. For some unknownreason, organisms use left-handed amino acids almost exclusively in makingproteins (the other mirror image, while rare, is sometimes used in other processes).? "Outsideof biology the ratio of these chiral forms is 50-50, so we want to understandthe starting point of life's preference for left-handed amino acids," saysOrlando Santos of NASA Ames Research Center. Santos and his colleagues are designing asmall satellite that would carry up biologically relevant molecules to see whateffects space has on a sample's handedness, and whether this could explain the originsof homochirality. "Otherresearchers in this field have tried to reproduce space conditions in alab," Santos says. "But artificial systems are just that. We want totest the theories in a natural environment." The projectis part of the Astrobiology Science and Technology Instrument Development andMission Concept Studies. In a follow-up story, Astrobiology Magazine willprofile another NASA-supported experiment that hopes to address how handednessin space might be delivered to the ground. Theevidence for a space origin for homochirality comes from meteorites. Several ofthese space rocks contain amino acids, and in a few cases the left-handed aminoacids have outnumbered the right-handed ones by as much as 15 percent. "Thereis no doubt about the left-handed excess in meteorites," says SandraPizzarello of Arizona State University, who has done extensiveanalysis of various meteorite samples. She has found that they containhigher than normal levels of the isotopes deuterium and carbon-13, which wouldargue that the molecules came from space and are not simply contaminants fromEarth. "Theisotope ratios imply that at least parts of each molecule formed in a coldspace environment? at less than 50 degrees above absolute zero," saysGeorge Cooper of NASA Ames. However, itis unknown what mechanismin space could impart handedness to amino acids or any other molecules. The mostpopular candidate is circularly polarized ultraviolet light. Amino acids arebroken apart by ultraviolet light, but if this light is circularly polarized(rotating in a clockwise or counterclockwise direction), the destruction of onehand will be faster than the other. "Bothhands decompose in the light, so it turns into a race toward totaldestruction," Pizzarello explains. "An excess of one hand can be madethis way, but there will only be a small percentage of the original materialleft over." The maximumexcess that has been generated in the lab has been 9 percent, according toPizzarello. This is considerably less than what is observed in the meteorites,so it's unclear what would make up the difference. Anotherconcern is that circularly polarized light has never been detected inultraviolet wavelengths coming from an astronomical source. It has only beeninferred to exist around neutron stars and inside dense molecular clouds wherestars are forming. Analternative possibility is that magnetic fields can help to promote one chiralform over the other. Louis Pasteur, who was the first to observe homochiralityin a biological sample, imagined that magnetic fields might play an importantpart. Latertheoretical work showed that a magnetic field lined up with ultraviolet lightcan destroy one chiral form more readily that the other, just as in the case ofcircularly polarized light. "Inour solar system, you are more likely to encounter a magnetic field thancircularly polarized light," Cooper says. However,many scientists have tried but failed to create higher concentrations of onechiral form with magnetic fields. It wasn't until 1997 that anyone succeeded inshowing the magnetic effect, but it took a huge field of more than a Tesla,which is 10,000 times the Earth's magnetic field. With noclear mechanism at play, it may be that several factors in space work togetherto produce an excess of one hand over the other. "Themeteorites were exposed to a variety of effects - some that we don't even knowyet," Cooper says. Cooper isworking with Santos, Arthur Weber and others in the NASA Ames Exobiology Branchto develop a simple satellite based on the design of another experimentcalled O/OREOS.? This new satellite - entitled Exposure of Organics On aSmall Satellite (EOOSS) - will be used specifically study chiral effects inspace. The plan is to carry up amino acids and other organic compounds andexpose them to UV light from the sun and the magnetic field from the Earth. "Thelight and magnetic field can be produced in a lab, but we think other factorscould be important like microgravity," Santos says. "The lack ofgravity might help orient molecules, so you could get away with a smallermagnetic field." An on-boardpolarimeter will record the polarity of light going through the samples, andthereby determine if one hand of molecules begins to dominate the other. Datawill be collected in real-time and beamed down to Earth. The Earth'smagnetic field probably had little influence on organic compounds falling ontothe planet from space. However, it can serve as a proxy for magnetic fieldsthat presumably existed billions of years ago when these compounds formed. "Wewant to simulate the early solar system environment of these organics as bestwe can," says Cooper. "It'salways good to go and test something in a real setting," says Pizzarello,who is not involved with the project. However,she is not sure that the Earth's magnetic field will be strong enough. "The devil's in the details," she says. Right now,Santos and his colleagues are working on their design, and they expect inJanuary 2010 to have a final decision on whether to go forward and build theirsatellite. If all goes well, a launch could happen in 2011-12, Santos says.